Jim Albertini, a long-time organic farmer and non-violent activist for justice, peace and the environment, will be the keynote speaker at “Sowing the Seeds of Peace,” Maui’s annual Hiroshima and Nagasaki remembrance on Monday, August 5. The free, public program at 6:00 pm in UH Maui College Pilina Multi-Purpose Room (upstairs, Student Lounge building) will also feature performances by Maui Taiko drummers as well as koto musicians. Come at 5:30 to learn how to make origami peace cranes, and stay after the program for the usual wonderful tea by Lillian and friends, and other refreshments. Albertini’s talk is titled “Hiroshima, Fukushima, and the Global Crisis of Violence –Where do we go from here?” He is the co-author of two books –The Dark Side of paradise — Hawaii in a nuclear world, and Hawaii Journeys in Non-violence and is a founding member of Malu ‘Aina Center for Non-violent Education & Action in Kurtistown, on Hawaii Island, where organic foods are grown to share with those in need. Jim Albertini spent nearly 2 years in jail and prison for his non-violent witness for justice and peace. He was named by Pax Christi USA as its 2010 Teacher of Peace, and in 2012 the Interfaith Alliance Hawaii presented Jim and Malu ‘Aina their award for encouraging non-violent civic participation. 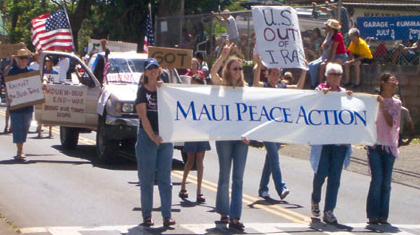 Sponsors of the program are the UH Maui College Peace Club and the Hiroshima/Nagasaki Commemoration Committee, a coalition of Maui faith communities, organizations and individuals, including Maui Peace Action. Please forward to all interested.